Merry Christmas from me and the little ginger bread man! Have a happy Holidays and remember to eat lots of chocolate. And that giving is more important than receiving. And so on. Peace out! My red dress for this year is from Trashy Diva. Merry Christmas, beautiful. Wish you to spend amazing time with your family! Happy Christmas, Always be happy with your family. Happy holidays. Red cloth is very fashion by the way. My very best wishes for 2013! 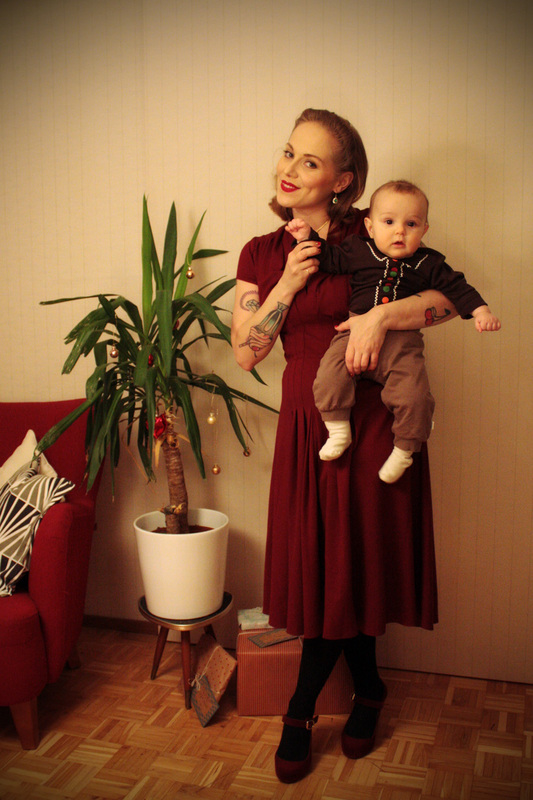 Wow, the red Christmas dress is really amazing and your baby is also too cute, both of look amazing together and your tatoo is too different just love the combination. Better late than never... Happy New year, Ulrika! I would appreciate a lot if you could give me a personal advice. Im doubting between two Trashy Diva dresses and I was trilled when i found you were wearing both! Its not that I followed the dresses through the net and found you, its that I have followed you for almost a year and found the two dresses here, wich makes the coincidence bigger. So, Im doubting between the Mansfield and Jenny dress (the colour is another dilemma between military and burgundy) and i would like to know wich one would you chose if you could only have one dress. Our meassurements are not the same but i feel that our proportions are quite similar, altough im a fuller in the bust area and my mummy tummy is more recent :( I feel that the jenny dress wont be very forgiving with that specific point. If in some moment, when possible, you got a few minutes to write your opinion i would be very grateful. Oops.. i think i sent my comment more than once, i was having some trouble with my Google account, sorry. THe Jenny dress is more comfy. It's possible to nurse with both (even though rather modest they open up enough to get a breast out if needed.) I also had a small dilemma with the color, I wanted to get both dresses but thought about weather it was dumb to get the same color x2. But I am very happy with my choice, it's the perfect burgundy! I realized I would not wear the green as much. The Mansfield dress has a seam in the waist which won't stretch that much, although the fabric otherwise stretches. So if you eat a lot the dress will say stop at some point. Having that said the Mansfield is still in no means uncomfortable. The Jenny dress has no waist seam so it's a bit more comfy however. The fabric is rather heavy so the dress shows less soft spots than one would expect. So in one way the Mansfield would be more forgiving, but then again with a full bust (or very milk filled breasts:) together with the cummerbund waist it can make you appear a little "stuffed". I think I like the M dress a little bit better stylewize for me (at least right now, with winter shoes and so on), although I can't say for sure which one I'd choose if it would have to be only one... J is comfier and more girly, M more "ladylike". Hope this was of any help? Oh, and one more thing, the J dress is perhaps in one way easier to wear; easier to pair with cardigans etc as it has no collar. Ok... now i'm doubting again... but for different reasons! No, seriously, your review is very helpful, with mummy tips included :) You touched the point that worried me most, that with my breast i would look a bit stuffed in the Mansfield dress. And you gave the info I needed about the fabric of Jenny dress, that was the main reason to doubt. Anyway, I dont rule out to buy both, the mansfield can be quite useful in this moderate weather, it would be enough with no coat most part of autumn / winter / early spring. The problem is that I hear voices in my head, those siren songs from other dresses all thee time, like.. "Buyyy meeee, pick meeee", and i need to chose. Im sure you know what I am talking about :( Its a shame that Trashy Diva dont use you as affiliate, Im sure that your blog encouraged many other women to buy there.